Welcome to my website. 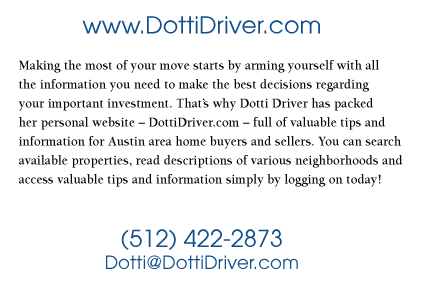 If you are searching for a home in Austin Texas, you have reached a user friendly site to find real estate. Whether you are buying your first home, looking for investment property, or that special place called ‘home,’ you will find up to date real estate information on my site. I am happy to help you with your search and get you settled in your new home. We are very proud of our music heritage and have many venues to listen to some great artists—many times for free. It is also an active city and we take pride in our many parks and lakes. Lady Bird Lake runs through downtown Austin and has hike and bike trails as well as places to rent kayaks, canoes, and rowboats. Our fair weather allows for lots of beautiful days to laze around the lake and let your cares float away. Our newest adventure is the Formula One racetrack in Del Valle. We are expecting an influx of racing aficionados. The many hills in Austin are a surprise to most visitors who imagine Texas as flat with no trees. It’s a great place to ride a bicycle and work off some calories. Our Texas State Capital is located in Austin and it is great fun to watch the shenanigans and goings on in our legislature. So, whether you are an exercise nut, political nut, or academic nut, you will most likely fit into our culture quite well. I have lived in Austin since 1977. It seemed like a small town when I first moved here and the city seemed to revolve around the University of Texas. Since I had 3 sons, seasonal tickets to UT sports were necessary. I was raised in Arkansas and graduated from the University of Arkansas with a degree in Biology. After I moved to Austin, I became a loyal Longhorn fan. Whether it is football, basketball, soccer, or swimming, you will find me cheering the Longhorns. 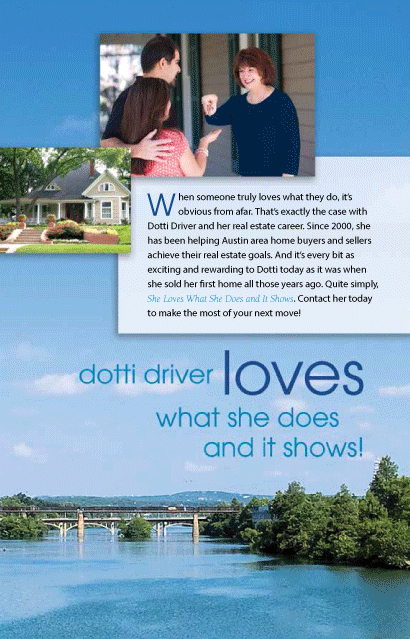 I have been a Realtor since 2000 and have found this career to be quite satisfying. I love helping my clients either buy or sell real estate. If you have questions about Austin in general, or real estate related, don’t hesitate to contact me.